In Season from June and August through December. You may ask, where can I buy fresh wild chanterelle mushrooms in the United States? You have found the source. We buy directly from the harvesters so they are the freshest chanterelles you can find. 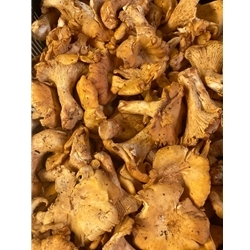 The Golden or Yellow Chanterelle is a very popular mushroom and versatile. The Chanterelle has a faint fragrance of apricots and an exquisite woodsy flavor. This is a perishable item and it must be refrigerated upon arrival. We suggest putting them into a strainer in the product compartment in your refrigerator. Do not store in plastic, they need air circulation. The Cantharellus is Oregon's State Mushroom. These Chanterelles are from Oregon or imported from Europe. They are know also as girolle, pfifferlinge, european wild mushrooms, fresh chantrelles, fresh chanterlle, because it is easily misspelled! When Chanterelles are out of season, Try Fresh Hedgehogs or Yellowfoot instead, they are both similar in flavor.